Thanks for posting the slides. I'd enjoy hearing the audio as well if you are able to post it. Not sure if anyone else will find this amusing, but when I was reading slide 5 "d(LL) > d(HH)" I could not help thinking of Tolstoy, "All happy families are alike..."
+30 SDs sounds like a very provocative statement. I find it difficult to envision what an IQ above about +5 SDs entails. One thing about the maize analogy, that change was in oil content if I read your other post correctly. Is there any reason to believe oil content is heavily selected for in the wild maize population? I would think intelligence is highly selected for in the human population and it is likely to be fairly optimized in the population already (thus less improvable than something not highly selected for already). Can you offer any thoughts on this? "intelligence ... fairly optimized in the population already": the results imply lots of extant variation to work with. Just imagine flipping all the (-)'s to (+) in a particular person. You get a lot more than +5 SDs. 39 = 30 at this level of precision. 10k is better than an order of magnitude estimate, but could easily be off by a factor of 2-3. The problem with that question is it assumes that intelligence has always been one thing and that the +'s and -'s have always been the same and that they are the same everywhere. The Inuit are short, round, stocky. The Tutsi are tall and rangy. Both have adapted to their physical environments. The short stocky Tutsi would be maladapted. In the developed world, where it is a meaningful phenotype, IQ may similarly be a measure of degree of fit between the intellectual environment of the particular society and the individual genome. This environment is not uniform in the developed world and might be even less uniform than it is. When looking at the figure showing selection pressure on (+) and (-) alleles, think millions of years and the difference between humans and apes. There has clearly been directional selection for cognitive ability. Differences between groups of people or between detailed selection pressures provided by human environments are negligible compared to what happened during those millions of years. I agree, but you're making an error I think in using cognitive ability equivocally or in at least three different senses. 1. IQ differences between people living in the developed world. 2. Something similar but not identical to cognitive ability today in humans living 100s or thousands of years ago. 3. The differences between men and apes. 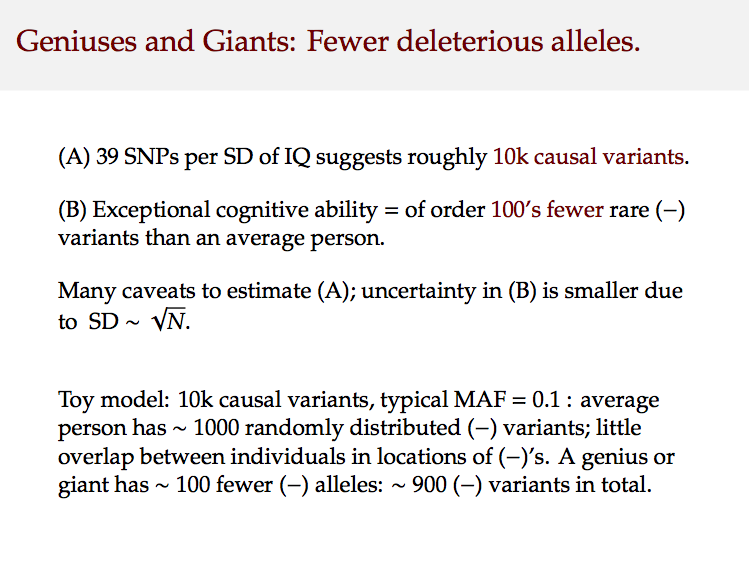 Rare deleterious alleles explain almost all of the difference in IQ. Is that right? The +'s have been selected for, the -'s have accumulated over time near p = 0 but haven't been eliminated. But it is very important to show some overlap in alleles associated with cognitive ability in populations around the world. The point in allele or SNP space about which the Hs are condensing (all +'s) may differ from place to place not to mention time to time. You may be right that 1,2 and 3 are slightly different from each other. We're just at the beginning of this research and one can imagine study designs that will get at this question. For example, once we know where the causal variants are for modern humans we can compare to earlier hominids like Neanderthals, whose genomes we have sequenced. We can also look at primates. It's an important question whether the same loci are detected as linked to intelligence across different times and cultures. We can look at very old people who were educated in the early 20th century (assuming we collect DNA from them soon; we can get IQ scores from military or school records), people raised in the Amazon rainforest, etc. Other experts I spoke to in Edinburgh share my belief that we can determine much of the human genetic architecture once we have of order millions of genotype-phenotype pairs (probably in the next 5-10 yrs). There are a number of interesting and open applied mathematical and computational problems related to genetic prediction using such large datasets. Animal and plant people have had great success already in genetic prediction but are dealing with smaller effective populations. One important aspect of the toy model I discuss in the talk is that if it is correct, then any couple has the potential of producing a nearly max IQ child, because there will be little overlap between the locations of their (-) alleles. That is an interesting thought. Is there any meaningful way to include non-human genomes in your analysis? On a related note, are you planning any analysis of estimated time since different mutations occurred for the SNPs you are investigating? It would be fascinating to identify genetic changes corresponding to intelligence around the time of the human migration out of Africa. Steve - I have a pre-frosh question on IQ. When we talk about SD's of "IQ" or "g" is an assumption made that it will be normally or log-normally distributed, and the results of all measurements are then mapped onto a bell curve, or is there some metric which tells us that the 10 points of IQ between 100 and 110 are somehow "equal" to the 10 points of IQ between 110 and 120? Your question is actually a deep one. g scores are *scaled* to fit on a normal distribution. Unlike height or weight there is no obvious correct unit. Whether +1 SD in changes are "equal" independent of where you start in the distribution is really a question of "validity" (technical term, meaning what real world outcomes are predicted by g scores) and depends on external societal factors (e.g., capitalism, market structure) and/or the nature of pursuits such as math or science or technology. Note that since g is clearly polygenic and mostly additive in genetic architecture, it is natural to expect (central limit theorem) that it will be roughly normally distributed in a population. (At least, if one adopted a different set of units for g that did not result in a normal population distribution, the underlying genetic architecture would make no sense.) One can go further and note that evolutionary dynamics (e.g., as formulated by Fisher) are driven on the rhs of his famous equation by additive variance. So one could say that evolvable population traits are likely to end up normally distributed. It seems plausible that cognitive ability depends on many biological/physical subfactors in the brain, such as efficiency of neural function, brain volume, etc. that do have a natural unit of measure, and these subfactors are likely normally distributed in the population. Finally, regarding the +30 SD number, one could reason in a completely different way. Since only 10 billion or so humans have ever lived, and there are probably many many more distinct genotypes/phenotypes (e.g., 2^(many thousands) based just on gene variants), it is unlikely that the already realized phenotypes could be near the maximum potential of the species on any trait. I often argue with other physicists about the true exceptionality of, e.g., Einstein, based on this kind of logic. I worry about the normality assumption when I think about Henry Molaison. I suspect there are nasty fat tails out there due to brain structure. And I worry that humans, at this particular time, are going though some post-neolithic revolution in that brain structure. As we all agree (i think? ), ten-thousand years ago selection pressure dramatically changed for us. "As we all agree ... dramatically changed for us" Tolerance for milk. What else has this selective pressure selected or is 10,000 years not enough? The diseases of civilization are proof that the biological changes one would most expect haven't occured. The Piraha have no words for numbers, but when raised among Brazilians they have no trouble learning arithmetic. "One important aspect..." Then how would one improve the species? I would be suprised if Elon Musk weren't the product of some National Party experiment :) but how did they do it? The very rare "alpha double plus variant" might go undetected. "...people raised in the Amazon rainforest, etc." A g could be measured for these savages and each assigned a z score. But the subtests would have to be tailored for them. "...are slightly different from each other..."
Not slightly. It's OK, you're not alone in forgetting that "cognitive ability", "intelligence", "smartness", etc. are first 7, 4, 2, etc. syllable collections of morphemes. They are not fingers pointing to an object. So I understand when you say '"scaled" to fit on a normal distribution', is the validity of an IQ test established by the fact that it generates a normal distribution in the testing outcomes? We get more adaptive mutations as the population gets bigger, but I think the dominant factor is still the extant variation -- e.g., (-) alleles that can be pushed to lower frequency by selection. So if Clark is right and free markets and industrialization selected for intelligence, future time orientation, ability to cooperate with others, etc., then the response would come mainly from decreased frequency of (-) alleles for those traits in each new generation. The amount of extant variation in any quantitative trait is likely to be huge, and a population can react to selection pressure using this extant variation, even if the mutation rate is exactly zero. (Over thousand year time scales the rate for producing new adaptive variants is pretty negligible.) This has been seen time and time again in animal and plant breeding. One set of experiments on drosophila (IIRC) was able to increase their flying speed by more than an order of magnitude! Weber, K. E. (1996). Large genetic change at small fitness cost in large populations of Drosophila melanogaster selected for wind tunnel flight: rethinking fitness surfaces. Genetics, 144(1), 205–213. PS Thanks for correcting my 10B number earlier! Dave - I imagine that most tests, take for example the S.A.T., do not result in normal (or shall we say "binomial") distributions of scores. So, for example, the SAT will tell you what percentile you fall into in a system where every question counts the same, (Is that really true? Does the SAT count every question the same?) but the underlying raw scores might not be normal. Of course, given percentiles, you can one-to-one map onto any distribution you want. I think (am not an expert) that when Steve says validity he means that you are gonna use the scores to do something, and if the scores are useful for that task then, in that way, the test scores are valid. One obvious example of validity is using an individual's test scores to predict their score when they take the test again. Another important example of validity would be if the SAT predicts college GPA. So, what Steve is saying is that if we want to assert that the difference between IQ 100 and 110 is somehow "equal" to the difference between 110 and 120 I will need to find some application of IQ scores for which that will be true. But, I can't think of any such application at the moment. As a result, we fall back on theories of intelligence which suggest it should be normal. Thank you for the Weber reference. That is enough to make me rethink my earlier argument about IQ already being selected for. You are being conservative with "more than an order of magnitude"--from 2.2 to 170 cm/sec in 100 generations! What I found especially surprising was that they observed "minimal or no fitness loss in selected lines compared to controls." I think this sentence from the abstract captures the results well: "Thus, major genetic change was achieved, but without the costs usually associated with strong directional selection." I need to spend some time reading the paper carefully. Do you know if results this dramatic have been demonstrated in other contexts? Yes, many. At ICQG there were lots of examples. Two that I remember well are size/temperament of chickens! The math is pretty clear that this has to be the case for most quantitative traits. "One obvious example of validity..." Yep. That's called "reliability". I thought of mentioning that but aside from the flushing reaction of some NE Asians does anyone really have a problem. It's pretty depressing living on the Res and Mexicans have no problem with it. The Irish were the first in europe to practice distillation after all.
" For "experts" in genetics, it takes a little longer :-("
Really? I did make a 10 on the old Probs and Stats SoA/CAS exam 110, though. I must have stopped reading the parenthetical at 'technical term'. I have a kneejerk response to validity. Is it complete and correct? The SATs and GREs use a formula to generate questions. The questions' binomial probabilities are calibrated as candidate questions in previous tests [I have two anecdotes about how this isn't all that great in practice; I'll spare you.]. These tests are ipso facto complete, and correctness [I'm speculating] is exactly about mixing the questions so the results of the test taking population hits a bell-ish curve. [The raw-to-scaled transfer is, my guess, known prior to the test, and only tweaked afterwards] I think that Steve has mentioned that these tests are proxies for IQ tests. The IQ tests that I took as a kid seemed esoteric, and I don't remember us taking them en masse. I took them in third and sixth grade based on teacher evaluations. Plus, the spatial cognition tasks are a different bird. Despite the fact that I score reasonably well on them, I can't tell you what makes one question harder than the other. So, with that in mind, my instinct is that there has to be some kind of external model against which you determine if an IQ test is correct. When I first read Steve's comment, it was jarring to think that you might cook up an IQ test the same way that you cook up an SAT. I took two IQ tests as a kid and they both felt like I was going mano-a-mano with the test writer, while the SATs and GREs felt like I was working an assembly line. Google tells me now, though, that the standardized test makers have taken over the generation of IQ tests, which is disappointing. All of this is touchy-feely and none of this really bears on the line of discussion that you and Steve were having. My sensibility is that the distribution of g should be a Weibuill with a shape parameter greater than 1 [had to look it up], and that talking about it as 'normal' is a local hack to make it palatable [nobody cares about the profoundly retarded or ineffably brilliant]. Juuuuuust a shot from the hip. Maybe, but I think we have discussed in the past that there is a significant average point gain from the first SAT to the second [or something like that]. Still valid, not reliable. "I think that Steve has mentioned that these tests are proxies for IQ tests"
The SAT and GRE aren't proxies. They are IQ tests. The difference between the Wechsler or Stanford Binet and the SAT, GRE, etc is purely nominal. It isn't statistical. Any test is an IQ test if it correlates with IQ tests as well as those tests correlate with each other. Where's the paper for this? What was the criterion of association of allele and phentype? The significance threshold will vary with the frequency of the allele. If this isn't taken into account there will be the bulge of significance for the rarer alleles. Quite clear. The immediate worry being alleles that have an unusually large effect, but have not converged uniformly across the population because they are advantageous in some environments, and disadvantageous in others. So, we could be faced with something between a high polygenic model with lots of equally important genes on the one hand, and a simple medelvian trait on the other. This is really what I was wondering when I first posed my question ...Raw test data may or may not reveal an answer ... Does the college board publish lots so raw test result data? Genes of large effect which are relatively common in the population are easy to detect in association studies. Given the lack of replicable hits in current studies we can place an upper bound on a combination of effect size and frequency in the populations that have been studied so far. 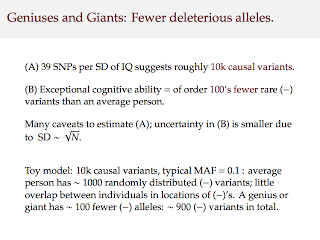 At least for Europeans (the focus of many association studies already), it is clear that almost all the variance is in alleles of small effect size and/or low frequency in the population. Sooo, I want to make the leap that says "all variance is in alleles of small effect size" [and ignore the second half of that sentence] and say that this is maximum entropy outcome. It is a consequence of IQ [above certain level] not yet being an evolutionary preference. So, to loop back to your other point, evolution is probably FLYING along right now due to assortative mating. How can I get some money down on this? OK, spent last night reading and thinking about it. The audio would have probably helped. I read the first 12 slides as presenting the concept in a theoretical sense, the next four talking about the empirical evidence for the theory and the last slide is the punch line. I gather from both the theory and the lab results that phenotypic expression is not controlled for dominant/recessive alleles. The whole of a chunk of DNA [i.e., both strands] is taken apart and analyzed in the same analysis. Is this correct? How association was determined is not part of the slides. This is very important. Wait for this before taking the results to be significant. The SNP genotypes contain the diploid structure: AA, Aa, aa. However, if (as we believe) causal variants tend to be rare, dominance is a relatively small effect. The # SNPs / IQ SD is obtained two ways: by comparing outlier groups and also by just regressing pairwise genetic distance against IQ difference for all, e.g., (5000)^2 pairs in the very homogeneous ALSPAC population. But we are still doing more analysis to make sure the results are real. Also, at BGA multiple research groups stepped forward with more phenotype / genotype data (some datasets as large as 10k individuals) so we want to analyze those as well using these methods. All of this will be described in gory detail in the paper and lengthy supplement. I'm not sweating the association. He could have picked 10k alleles out of a hat for the sake of discussion. It really only starts to matter to me in the context of actual numbers for d(HH), d(LL) and d(H)-d(L). The standard for association in terms of frequency difference between H and L depends on the overall frequency of the alleles. I think you mean effective rather than affective. I struggled with the choice of word there. In the end, I decided that there was no agreement that the alleles were truly causal [Steve said as much in his caveats], so I stole 'affective' because it is a weaker and implies only giving the appearance of. Do you imagine that IQ scores ask geography questions?